Internet, meet my food weakness. While mountain pie is certainly the most emotionally important pie to me, I always thought that apple pie was my favorite to eat. And now, I know that caramel apple pie is my favorite pie to eat. It’s delicious. It’s so incredibly delicious, I don’t really know what else to say. This may be my shortest post ever because I don’t know where to go with this except- drop everything you’re doing and make this pie. Now. Right now. Okay, I’ll say more. I’ll describe what makes this pie so incredible. It’s the caramel. It’s making your own caramel so that it has this nutty, toasty flavor. I used the same caramel recipe I used for my caramel fried green tomatoes, the caramel recipe from the recipe book Seasoned in the South. I was worried about the pie being way too sweet, so I added lemon juice. I like adding a little acidity to my pies to balance the sweetness, and in this case it accentuated the caramel flavor. I almost feel as though I could have added more caramel. I’m not sure, I guess my only choice is to make it again. Oh no! Peel and slice your apples. Melt butter in your pan. 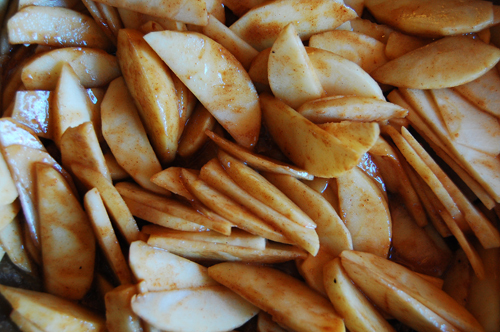 Add your apples, half of the caramel, and spices. Toss and cover. Allow to cook over medium temperature with a lid on for 20 minutes, stirring occasionally. 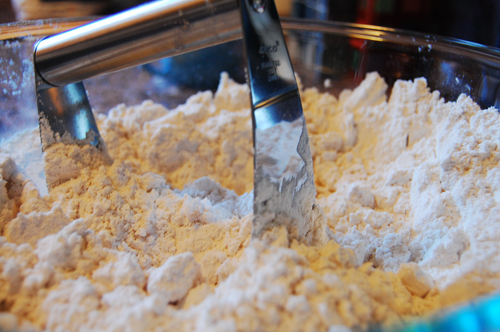 Roll out your pie dough. Add half the apples (and juice) to the pan. Drizzle with caramel. 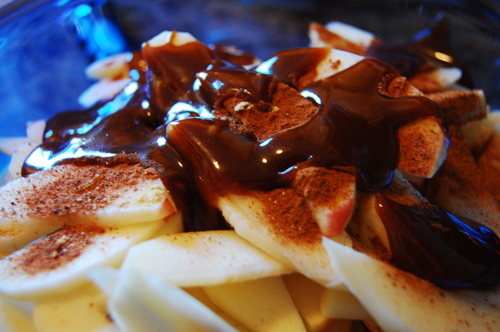 Add the remaining apples, and drizzle with the remaining caramel. 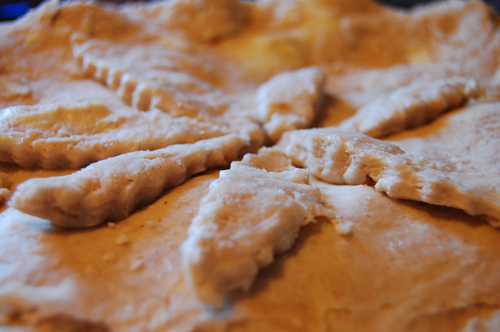 Cover with pie dough top. Slit the top. When I was in high school, I was a vegetarian. I decided to become a vegetarian for a few reasons. For one, I read The Jungle by Upton Sinclair. It’s a story about the turn of the century industrialization of the meat industry… ugh. I couldn’t look at a piece of meat without wanting to throw up. Also, I developed a very close friendship with a girl named Julia who was also exploring life without meat. Together we transitioned to chicken only, and then onto meat free. I’ll admit I slipped occasionally, but for the better part of high school and the beginning of college, I made due on a whole lot of black beans. This website is proof positive that I have rejoined the meat eating world, but now I try and consume a little more consciously. Dan and I buy all of our meat organic, cage free, antibiotic free, etc. I’m more comfortable being a part of the food chain when I know what has happened to the food I’m consuming. Julia and I used to talk about how we would eat meat if we were farmers, and we could guarantee that our animals had been treated right. Funny enough, that is exactly what Julia is doing these days. After graduating from Vassar, Julia moved to Los Altos, California to work at Hidden Villa Farm. Hidden Villa is a teaching farm that uses its facilities to teach the bay area about farming and social justice. Julia has had an incredible experience there, and she’s learned more about animal husbandry than most of us will ever know. 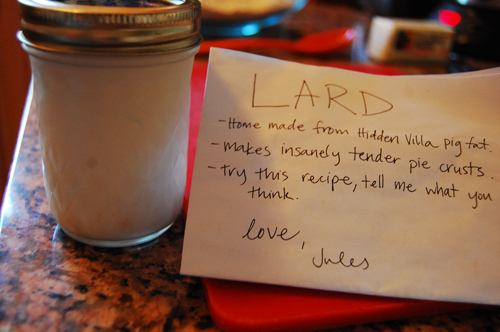 As part of her wedding gift, she gave us lard that she harvested from Hidden Villa, along with her pie dough recipe. Lard plays the same role in doughs as vegetable shortening or butter, it’s just a fat that helps hold the dough together. And this dough was incredible. 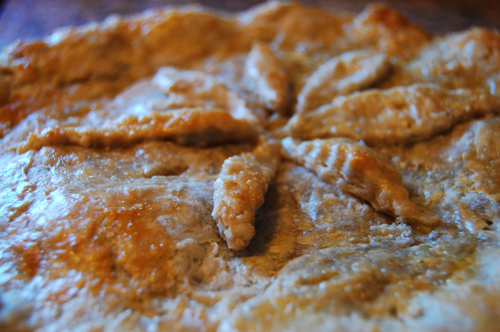 It was flaky and delicious, the perfect compliment to the caramel apple pie I made on this brisk October day. 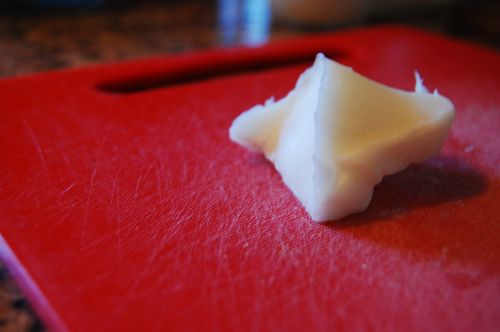 Cube butter and lard, and work into dry ingredients with your hands or a pastry blender. Use a wooden spoon to stir in ice water, a little at a time. 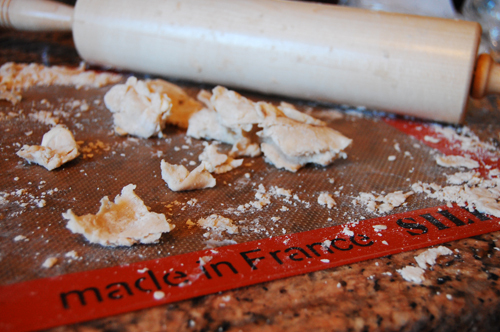 When the dough is able to easily form a ball, separate in half and wrap with plastic wrap. Refrigerate 30 minutes, then roll out for your pie. Happy 1 year, Biscuits and Such! So one year ago today, on what was a basic WordPress blog, I started this website. My first post was Country Style Steak with Jasmine Rice. It was photographed horribly in an apartment I can only now associate with bed bugs (but also had bad lighting). The steak turned out alright, but not great, and I remember wondering first if I was making the right choice, and secondly if I thought anyone in my family would find it (or worse judge me about it). A year later I’ve gotten an incredible amount of positive feedback about this site, and I couldn’t be happier that I decided to push through. I am excited every time I cook something for this site and I love every minute of it. It’s given me an outlet, a hobby, a place to put my frustration, love, and energy. I was planning a little something for the blogoversary, but I severely underestimated how exhausted I would be after the wedding. I’ve been doing nothing all week and I still feel like I’ve been hit by a very large, opinionated bus. I promise a wedding post is coming (accompanied by one of Beaufort Grocery’s recipes), as well as some exciting news in other areas of the b&s world. For now, I wanted to thank you all for making this site so special for me, for giving me a reason to keep doing it.